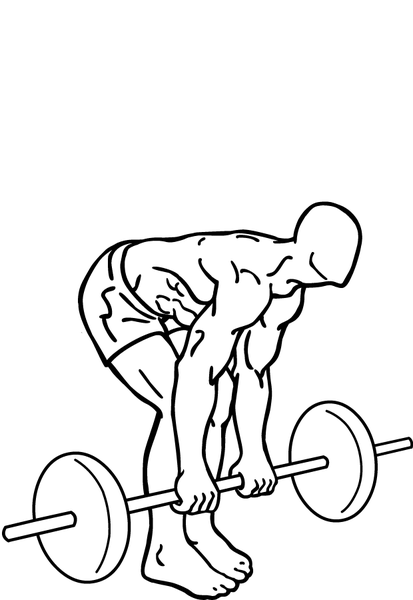 Romanian deadlift is a powerful back & core strengthening workout. It's a weight training exercise that works out parts of your general midsection (abs, flanks, glutes) and is specially targeted at developing your lower back. This lifting exercise also engages parts of your arms and legs (hamstring, calves) even as it forces you (in a positive way) to pay attention to posture and technique. It is this latter part where doing a Romanian deadlift 1-2 times a week will help. Think of two of the most stressed or pain-prone body parts (or muscle groups) you encounter during the course of your weight training program. I'm sure hamstrings and lower back pop into your mind (just look at the figure to the left, above, to understand why this is anatomically true). The hamstring muscles in your legs and the sensitive areas in your lower back are often prone to post-exercise soreness, pain, debilitation, and even injury. Doing Romanian deadlifts once or twice a week insures that these muscle groups stay strong, pain-free and powerfully supportive toward the rest of your training load. While it is common to do Romanians with barbells, you can very well use dumbbells or even a rudimentary sandbag to get the same results.